Colorful stem plants planted in the background of Nature Aquarium – they are essential background plants to bring a bright and vibrant atmosphere to the aquascape. Stem plants can grow as a single stem, but their inherent beauty stands out when they grow in clusters. The special feature of this issue introduces the layout techniques to grow clusters of stem plants to bring out the best of the plants’ stunning perfection. Why don’t you add a bright and colorful touch to your room with an aquascape having lush stem plants? Among aquatic plants, there are particularly a wide variety of stem plants. Their greatest attraction is the beautiful colors including bright green and red, which cannot be seen in other aquatic plants. If we look at only a single stem, it is no so impressive, but on the other hand, it stands out when the stem plants thrive in clumps. It is what we call “the beauty of plant cluster”. The trait of growing in clumps is the stem plants’ strategy to occupy a wider area to perform more advantageous photosynthesis. What is interesting is that this trait of stem plants also leads to their fascinating appearance. It is a wonderful idea to grow stem plants in clusters and bring the best of their charm to your layout. What brings out stem plants the most is the dense vegetation. It is overwhelming to see the beautiful clusters of stem plants growing luxuriantly to fill the entire background. 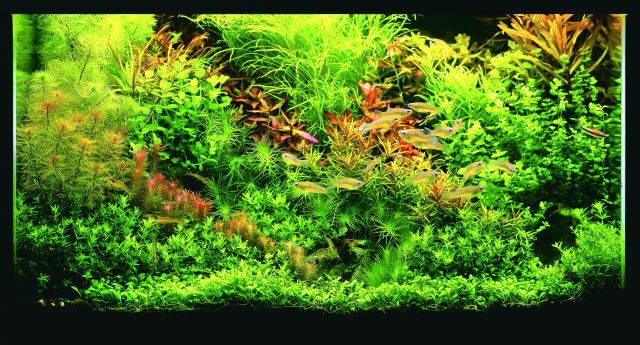 This section introduces some aquascapes with gregarious beauty in their backgrounds. A large clump of Microsorum sp. 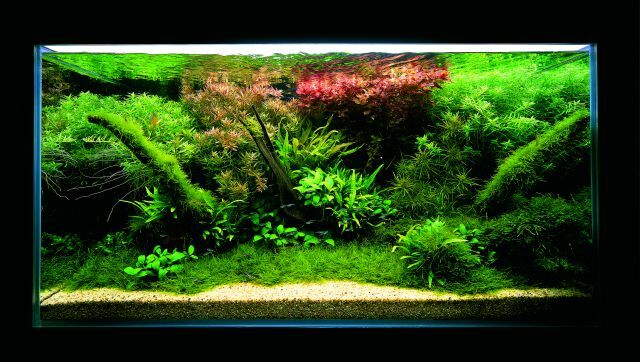 (Narrow Leaf) is surrounded by thriving Rotala rotundifolia (Green) and Hygrophila Polysperma. Dark red Rotala Macranda is planted slightly off the layout center to the right to keep the balance of the focal point. Red and green stem plants are planted alternately to add a different touch to the background to avoid monotonous aquascape. This layout is composed of stem plants alone from the midground to the background. The assorted stem plants add a cheerful touch to the aquascape.